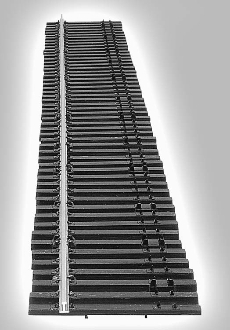 The 2003 8'-6" H-O scale Central Valley Tie section (CVT) is the first major track product in decades. The 2003 8'-6" H-O scale CVT is designed with first-hand experience in H-O scale track installation techniques accumulated for over 50 years, as well as countless suggestions offered by fellow craftsmen and model builders. Ideas and features from the first fiber tie strip to the latest, but not so , molded ready-to-run flexible track systems have been examined. The best of all this is now available in the 2003 8'-6" CVT, plus volumes of ideas which make the 2003 8'-6" H-O scale CVT track system far superior to all other track systems offered today. Because the H-O scale CVT track system falls into the category of "Hand Laid", this H-O scale CVT track system may look like a step backwards, but that's where the step backward stops. From that point forward the 2003 8'-6" H-O scale CVT ties are "hands-down" far superior to any track system ever. The 2003 8'-6" CVT is injection molded in Styrene, with working tie plate design (self gauging), working rail anchors (when pushed over), working scale spikes (when pushed over), and scale wood grain detail. The H-O scale CVT track product is extremely flexible and easy to install on your roadbed, and no toxic glues of any kind are required. The 2003 8'-6" H-O scale CVT is self-gauging with code 83, and code 70 rail sizes. Let me give you several reasons why you should choose and implement this revolutionary 2003 8' -6" H-O scale CVT track product on your next, or first H-O scale model building project. All the CVT tie products produce smooth, accurate radii limited only by the wheel base of equipment you choose to operate on all your CVT. The 2003 8'-6" H-O scale CVT tie sections are designed with 8'-6" tie lengths randomly placed along a prototypical 19-tie per-33' average. 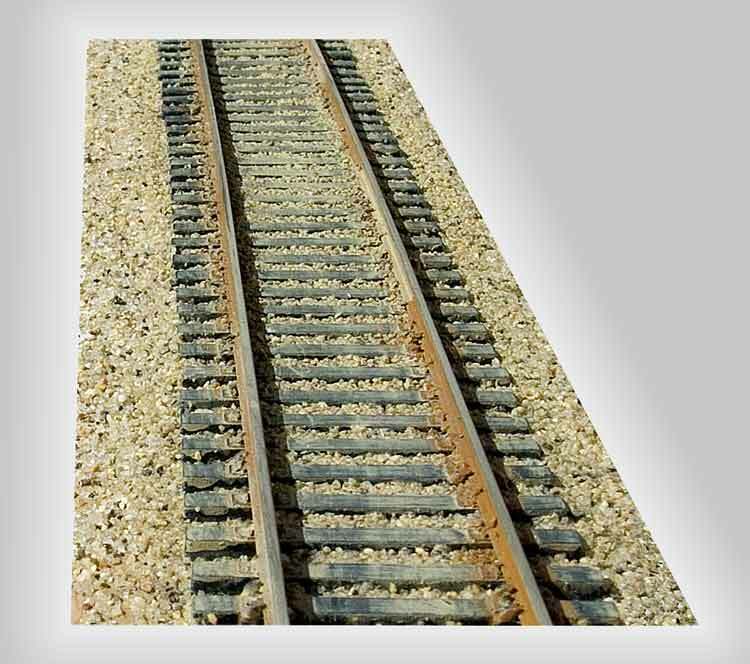 Some ties are slightly out-of-square, misplaced, and mismatched to achieve the most effortless realistic mainline H-O scale trackage ever manufactured. Joining two pieces of H-O scale CVT together for a continuing smooth radius is superior to all other methods. In-turn, this allows craftsmen to construct reliable rugged staggered rail joints. The 2003 8'-6" H-O scale CVT tie sections can be pre-assembled with rail at the work bench to allow craftsmen to install track sections in hidden and hard-to-reach areas with ease. Because of the H-O scale CVT products unique "hollow" design on the under-side, the H-O scale CVT tie sections can be glued in place with simple non toxic environmentally safe white glue, which allows the glue to grab hold in areas which are protected from harmful elements. With the 2003 8'-6" H-O scale CVT, there is no need to glue the rail down because when pushed over with a Stanley 2/32 nail set, tough integral rail anchors and spikes hold your rail into the realistic tie plates. The 2003 8'-6" H-O scale CVT allow craftsmen to paint, ballast, and detail the track at any point during installation. The 2003-6 package includes enough CVT material to build over 6 feet of mainline track. These features allow the craftsmen to have free rein from the first design, to making final adjustments during construction.